Mum and I have always been close, but more so since I moved to Malvern to be near my parents in their progressing years. 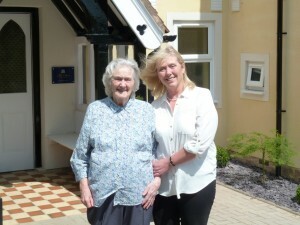 I helped her care for my father in his final years and, along with my sister Lesley, have looked after Mum since. We were determined to keep our promise to our Father to ensure the best care for Mum. Following our father’s death, Mum needed mostly emotional support, however, this changed over the years, and help in doing those ‘everyday things’ grew. Life adjusted around the commitment I’d made and it was a pleasure to care for Mum, who really appreciated the support. Mum was content and happy living independently, and was determined never to move into care. However, caring for Mum with dementia became more challenging and living independently was causing us concern. Like many who commit to caring for family members, the adjustments I made in my professional life were still not enough to accommodate the time to provide the care needed. My sister, who lives in Canada, spent her holidays in Malvern, not only to spend time with Mum, but also to offer me a break. My role had gradually changed from being a daughter; I had become Mum’s primary Carer. Following three months of poor health, Mum was frail, needing more care and support than it was possible to offer, whilst she remained living independently; I was exhausted. Mum was adamant about staying in her own home, however, was unaware of how great her care needs were. Raising the topic of respite care was difficult. My sister and I felt we were betraying Mum’s wishes and the promise we had made. Once discussed however, my mother willingly made the move, understanding it was a period of convalescence, following which, she could return home if she wished. Choosing a care home with a parent is never easy, but fortunately through my professional role, I had knowledge of the great choice of care homes in Malvern. Being a ‘free spirit’ in nature, a priority was to choose a home where Mum’s freedom of thought would be respected and encouraged. Naturally, standards of care were high on the agenda and it was essential that we chose a home where Mum could stay and receive supported nursing care if needed. In addition, we wanted a rural location as Mum moved to Malvern to enjoy the beauty of the hills. On making contact, I was delighted to find familiar faces including Lynne, Helen and Moira; I had first met Lynne years ago when my father had needed care, so I knew there was a professional and experienced Care Manager in place which reassured me. Showing me around, Lynne was open and honest about life in a care home, and I felt that I was being given a true picture. Both residents and staff seemed relaxed, free to be themselves and there was a lovely warm and homely feel about the place. In addition, there were beautiful gardens to enjoy. Mum moved in for respite, with the option of going back to her flat with 24-hour care. Yet once settled in, Mum decided she no longer wished to move back home, she was happy and content where she was. Mum loves the freedom of living in a large house again. She enjoys the opportunity to enjoy the different lounges, sitting in the garden in the fine weather, and waking each morning to the beautiful view of The Malverns from her bedroom window. 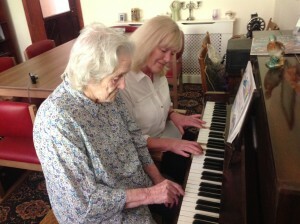 Mum has also started playing the piano again, which brings her great pleasure, and we often sit and play duets when I visit. Mum enjoys the company during the day, and retires to her room in the evening to watch her favourite TV programmes. She loves the day trips out and the social interaction, as Mum had always been actively involved in both the family business and the local community. How wonderful it is, to see that not only does she still has the freedom to say NO, which endearingly has become one of her favourite words in recent years, but also that her decisions are listened to and respected. Seeing Mum happy, well cared for and content is wonderful. Through the care and support given by everyone at The Chace, it has enabled my sister and I to become daughters again. Once more, we enjoy spending time together, chatting, laughing, and appreciating each other’s company. Sometimes I stay for lunch or tea, and I know I can drop in any time I wish. Knowing Mum is safe and so well cared for, means I have been able to step back into my profession as a Funeral Director with Laurel Funerals. The team at The Chace has become like an extended family to us, and we appreciate the love and care that they offer. On reflection, the situation we had all dreaded has turned out to be a really positive experience for us all. Keith joined us at The Chace in October 2010 after his deteriorating health confirmed that he needed a higher level of support and round the clock care than even his wife and close family could provide. Keith had enjoyed a long and successful career at Barclays Bank as both a Branch Manager and an Inspector – a background that stood him in good stead for keeping a close eye on all our actions and activities at The Chace. In his younger days, he was a keen cricketer and all-round sportsman and he retained this interest until the end of his life. His years of service to Barclays were interrupted only by the war which was spent in a far-flung outpost of the RAF. After his eventual retirement, his interest in sport remained and he took up golf and bowls as well as caring for his beloved vegetable garden and keeping a fond eye on his much-loved family of which he was immensely proud. His wife Stella, son Peter and grand-daughters Christina, Hannah and Martina provided a source of consolation and inspiration to Keith in his early days at The Chace which he undoubtedly found difficult. Keith was an independent man with strong beliefs and while he recognised that he needed more help, he was clearly saddened by what he felt was being “put out to pasture” and this may have contributed to his frequent bouts of ill-health. He was certainly cheered by the regular cards, letters and parcels from his family and in the final few months of his life, he began to find new interests and revive old ones which helped him come to terms with and enjoy his new life. 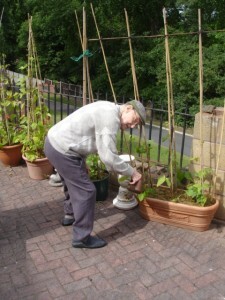 His delight at being able to grow his prized “runner beans” again was apparent in the way he shared his excitement with friends, family and staff both here and “around the world” as he put it. He took terrifically good care of them and also the other vegetables and flowers that mysteriously began to appear outside his back door. Eventually Keith asked for a hosepipe to be installed as he was finding it impossible to do so many trips with his tiny watering can! Keith put on record his heartfelt gratitude to staff at The Chace, his doctors and everyone involved in his care for what he termed ‘saving his life’. I also know much he appreciated the love and support of his family and whilst we are all saddened by his passing, it is hopefully comforting to know how much his outlook had changed and how much happier he was. We will miss Keith’s determined short walks, his jokes, his willingness to discuss the minutest workings of his innards and his pride in his “world famous” runner beans; most of all, we will miss him. Things that were important to Doug: Personal respect and dignity for self and others. His appearance, personal care, independence, maintaining his self esteem and confidence. Contact with his family, long standing friends and colleagues over his rich lifetime. Doug was a dentist for many decades in his home town. He and his wife, Connie were involved in many clubs and projects that were dear to their hearts. Together and singularly they were dynamic in their approach to life! Doug spoke fondly of his memories of his wife and childhood of his two sons, clearly having enjoyed his role in the family with great love and admiration. To support Doug in maintaining his significant character it was important to draw on his life experiences. Doug was a very well respected professional long standing figure in the community. Through his life he has seen generations grow up and return to his dentist chair with their own children. Whenever Doug was out and about, he was met with affection and respect. We accompanied Doug on regular visits to his now son’s Dental Practice, finding it amusing that he had taught him everything he knows! Doug enjoyed a joke about the witty side of dentistry as shared with an exchange of topical birthday cards from his practising son’s. The staff after decades of service still referred to him as “Mr Stokes” and made a real fuss of him on attending. It was lovely to see Doug respond to this warmth and certain satisfaction of past years with his loyal staff. Another clearly meaningful aspect of Doug was his long term friendship with his fellow University pals, who still after all these years got together regularly for lunch, sometimes at the home or on trips out. On other occasions they would spend time in Doug’s room. Doug was always smartly dressed and was said to have had more clothes than his wife! He loved to go to a local outfitter’s and buy clothes, again he was greeted with great warmth and the staff knew his taste and style in clothing. Having spent some money, Doug always liked to replenish his cash flow so a trip to the bank to top up would follow. It wasn’t enough to know his son’s would take care of this, Doug was used to being his own man and needed to continue being in charge of his own affairs. This was demonstrated by a need for Doug to send and receive Christmas cards to family and friends. He would have a steady stream of post and always wanted to respond, as he had done for years before however, this was becoming more difficult for Doug with poor sight and advancing dementia. We enabled Doug to fulfil this task by working with his family to achieve a positive and dignified solution. 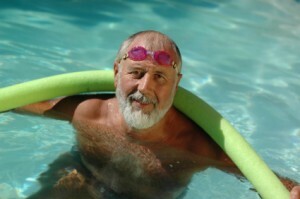 Not long before Doug’s condition deteriorated he came along to the local Hydro Pool. Doug was nervous about how he might cope but it was clear he was driven to achieve this, so measures were set in place to enable Doug to return to the water. Doug had loved watersports and often spoke of his enjoyment of this over the years. As Doug progressed in his sessions his confidence returned and he clearly enjoyed the experience of being in the water again. His face was a picture to see as Doug recalled his swimming days! All became clear when his son revealed “ oh yes, didn’t Dad tell you he was a very active member of the local life saving and swimming club for years!” All became clear – that’s what Doug was expressing to us with a charming knowing smile!